It’s hot. Miserably hot… and when the hot weather finally starts to burn through June Gloom, it’s time to prepare meals that are cold, refreshing, and not too heavy on the body. This is where my delicious dairy free orange Julius smoothie recipe comes into play. It’s decadent, but not overly so, it’s sweet but not too much, and it’s the perfect amount of citrus-y flavor goodness. And best of all? It’s refreshing even when it’s 100 degrees outside! I can’t explain just how good this smoothie is, so you’ll just have to trust me and try it for yourself. Dairy Free Orange Julius Smoothie Recipe – The Ingredients! I love that this orange Julius smoothie recipe is dairy free because I feel like dairy can make things a bit too heavy on a hot day, so instead I opted for a lighter base for this recipe. I often enjoy drinking this for breakfast to kick start my morning as it gives me lots of sustained energy until lunchtime, even after cleaning my whole apartment. You can watch me make it in the video below! So you may be wondering why I put this stuff in my smoothie. Well, if you could only smell and taste how freakishly amazing this essential oil is, you would totally understand. Citrus Fresh is a therapeutic grade GRAS (generally regarded as safe) essential oil composed of 5 citrus fruits including orange, tangerine, lemon, mandarin, and grapefruit as well as spearmint (you would never know that this was in there!) and it’s by far one of the best smelling essential oils I’ve come across. Citrus Fresh is known to stimulate and amplify creativity and well-being as well as disperse and eradicate anxiety. In fact, diffusing citrus has been proven to improve mental accuracy and concentration by over 50% so it’s no wonder you become more of a morning person after smelling and ingesting it. You certainly don’t need to put Citrus Fresh in your orange julius smoothie if you don’t want to, but it certainly kicks it up a notch like you wouldn’t believe. The pure and true taste of citrus is like a ray of sunshine. If you don’t have this essential oil already you can use orange, tangerine, or mandarin instead (you can get all of these essential oils HERE). 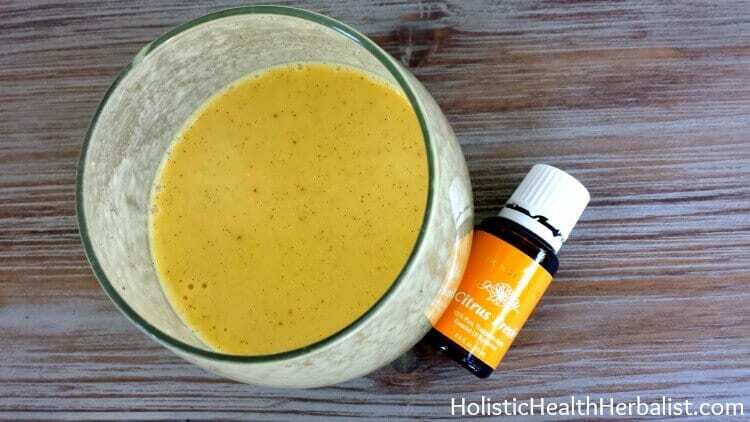 Here is another dairy free orange julius recipe I really enjoy: Orange Julius- Super Charged!